BOGOTA, Aug 7 2013 (IPS) - “I was a hunter. I killed many animals,” said Rosalino Ortiz, a representative of Mashiramo, a campesino organisation that monitors biodiversity in Colombia’s Massif range in the southern department of Huila. After taking workshops organised by the Rural Opportunities programme of the Ministry of Agriculture and Rural Development, financed by the International Fund for Agricultural Development (IFAD) “your mentality changes,” Ortiz said. “And I started planning a business” with 23 other campesinos (small farmers), he added. “It’s one of the best programmes,” said Cielo Báez with the Asociación de Productores Agroecológicos de la Cuenca del Río Anaime (APACRA), an association of agroecological farmers in the Anaime river watershed. “They transfer the funds to our account. They trust us, the grassroots communities,” she told IPS. “We decide what we really need, which is the reason for the programme’s success. Many people make those decisions from their desks,” and decide what tools to send communities, without consulting them – materials that end up “piled in some corner,” added Báez, whose association is in the mountainous municipality of Cajamarca in the central department of Tolima. “IFAD, through Rural Opportunities, has enabled our families to have a better quality of life,” she said. “Because they work in an integral manner, we grow stronger as a whole. “We have trained with them. We are 15 families with more or less two youngsters each: some 30 youngsters who have had access to education. Now they are still campesinos, but with studies. And we involve the entire family: the elderly, the children,” she added. The key to obtaining support from Rural Opportunities/IFAD is the word “business.” The programme has managed to bring together campesinos in associations in vastly different parts of the country. Andrés Silva, director of Rural Opportunities, spoke with Báez and Ortiz under the gaze of IFAD president Kanayo Nwanze, who came to Colombia after visiting projects in Peru backed by the specialised United Nations agency, which was created to support development initiatives among the poorest rural populations around the world. “This is the horn plantain. This is cacao. Here we have beans. We also have tamarind,” another campesino, Omar Caicedo, showed Nwanze. Caicedo belongs to the Cooperativa Agropecuaria de Usuarios Campesinos del Patía, a campesino cooperative in the southwest department of Cauca. 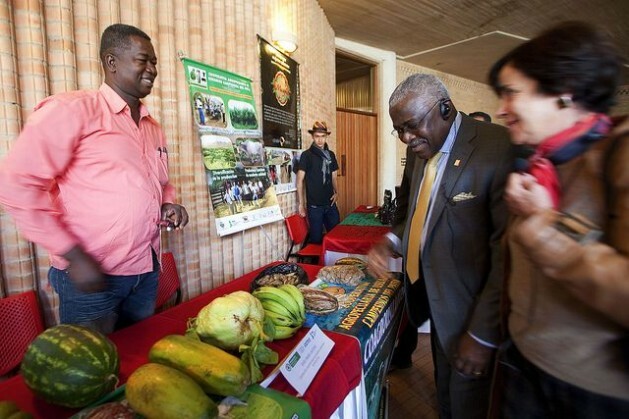 Nwanze, a Nigerian expert in agricultural entomology, was familiar with most of the fruits and vegetables he was shown. Until Caicedo pointed to the “hacepuede, an exotic fruit. It’s sweet, you can try it in juice, or just like this. It’s also medicinal. You can drink it when you’re fasting. It helps fight amoebas,” the campesino explained. IPS has also come into contact with other community projects backed by Rural Opportunities/IFAD, such as Ecopollo, run by female heads of households in the Asociación Municipal de Mujeres Campesinas de Lebrija (AMMUCALE), an association of campesino women in the east-central department of Santander. Thanks to the large sheds where they raise 1,800 chickens, which they sell in markets and nearby stores, or to local families, some of the women have even managed to send their children to university. The women involved in Ecopollo – which means ecochicken – say they have raised their children to love the countryside, and their university studies are for them to bring new skills and knowledge when they come back to Lebrija. Another project is the Corporación de Recuperación Comunera del Lienzo in the town of Charalá, also in Santander, where 70 farming families set up a production chain that stretches from the cultivation of organic cotton to the Museum of Linen. The museum, which operates in a large corner house in the town of Charalá, displays traditional weaving and dyeing techniques of the Guane indigenous people, who are now extinct in that region, once famous for its fabrics and weaving. Rural Opportunities/IFAD began its work in 2007 and formally ends this year, after financing more than 1,700 projects. Now it must reinvent itself. “We won’t invest in the same families,” the programme’s director, Silva, told IPS. The idea is for the associations that have become small rural companies to share their best practices with other groups of local families, and to help them avoid the mistakes they themselves have made along the way, in order to multiply the experience. One of the central objectives is to keep people from moving to the cities by offering alternative livelihoods in rural areas. The campesinos of Mashiramo are focusing on becoming a local network that helps link up other organisations: “We’ll be the businesspeople, who share our knowledge and experience,” Ortiz said. The result: organised knowledge that can be shared and replicated. But not only the communities have learned along the way. It has also been a learning experience for the agriculture ministry. “We have learned we have to support people, seek out knowledge, dig out the treasures from the local cultures, encourage the spread of local talent beyond the families,” Silva said.